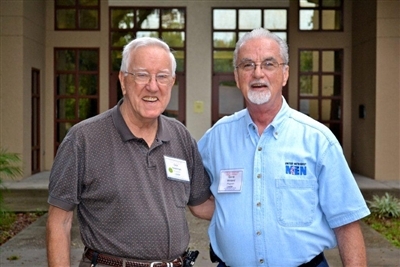 Living a Christian commitment is "not unmanly"
“I'd like men to know that here's an opportunity to know men and to come to grips with being a man and being for Christ.” That's the message that Don Heishman, co-ordinator of United Methodist Men’s Retreats, and Gene Winland, president UMM, want to send to the thousands of Florida men who are eligible to participate in the United Methodist Men’s retreat ministry. By virtue of their membership in the local church, all United Methodist men are automatically a part of the organization. The challenge for the ministry in 2011, said Winland, is to get men to commit to spending time apart in an inviting setting, such as the Life Enrichment Center near Leesburg. During the month of October, the 2011 retreats attracted between 650 and 700 participants from across the conference. 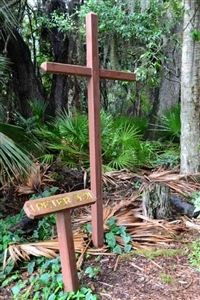 These kinds of retreats have been a mainstay of the Florida men’s ministry since the first one in Oct. 1949, but recent years have seen declining participation. Winland understands the challenges men face, but, as the organizational president, he is also a man with a personal relationship with God. And he believes passionately in the men’s retreats. “When God made men and women, they’re different,” he said. “The way men perceive things is different from women. In co-ed groups, the men tend to shut up and their response is different. But get the men in a separate group and they’re more likely to open up. I’d like to see more men admit that they need God.” Winland, a retired Air Force Officer from Riviera UMC in St. Petersburg, became UMM president in January 2011. The LEC's "Path of Silence" provided a place for prayer and reflection. “I think it’s imperative that this kind of experience is made available,” Heishman said. “Over the years, probably a third of the clergy in the conference heard the call to ministry through men’s retreats. The individual impact on men can’t be measured. Commitments are made here. That was my own personal experience,” he said. With the Men’s Spiritual Retreats at the core of their work, the UMM have supported many ministries, missions and scholarships, including Jim Russo Prison Ministries, Florida United Methodist Children’s Home, Foundation for Evangelism, Lay Renewal Program and Scouting. Winland asserts that since all male members of the local churches are automatically a part of UMM, there are thousands of eligible men who could benefit. “But the real question is participation. Our latest information is that we have 150 out of a possible 600 local charters right now. “What I hear men say the most is ‘why can’t we get the younger folks involved’,” Winland said. “That’s the objective. At the national level, it’s the same issue---trying to get the younger men to join in.” He believes the retreat experience is a critical element of men’s ministry statewide. Heishman, who has been involved with the retreats since the 70s, would love to see the website move from an informational archive to an effective vehicle for marketing. The bottom line, he said, is that the United Methodist Men in Florida have taken the retreat and the ministry model for granted too long. “It’s not unmanly to live out that commitment as a Christian. And it doesn’t make them less of a man to rely on Jesus,” said Heishman. The men’s retreats schedule for 2012 is already set, boasting a first-rate slate of nationally recognized speakers, musicians and, as usual, great accommodations: the food and scenery at the Life Enrichment Center. Two couples’ retreats are also scheduled. Interested clergy and participants can find out more information at www.ummflconf.org.